Muay Thai which is also known as Thai boxing is the cultural martial art of Thailand. It was originated some seven hundred years back in Thailand. The main intention behind the development of this martial art was to use this as a form of close combat and use body as a complete weapon. Muay Thai uses the entire body instead of weapons in the war. Here the hands act as a sword, then shins and forearms act as armor against the blows, whereas the elbow act as a hammer for the opponents. Apart from all these, the legs and knees act as the axe and staff. In simple words, the whole body operates as one unit in a war. Nai Khanom Tom is known as the father of Muay Thai. Every year March 16 is celebrated as the Muay Thai day in his honor. It is also named as the art of eight limbs because it uses those fists, feet, knees, shins, and elbows. Muay Thai is also known as Siam Boxing, which was named by the foreigners, due to the former name of Thailand. At the time of World War Two, the French people had named it as Le Sports Orient, which is also known as the fighting style of the Orient. The evolution of this combat sport is quite tremendous today. It has got all the rewards and acknowledgments. It was recently recognized as an Olympic sport. Muay Thai is gaining its popularity in many countries throughout the world. And to showcase its features and to enhance its popularity, new training camps and excercise sessions are being organized all over the world. 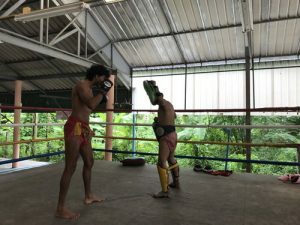 Muay Thai is a striking based martial art, still, it holds the throwing techniques, locks as well as the momentum of the opponent. It involves the mind, body and spirit and provides the confidence required for self-defense in real-life. it is undoubtedly too good for your self-confidence and inner strength.